After the decommissioning the Marine Corps Air Station El Toro, redevelopment of the land required many grade changes. The demand for “soft bottom” structures made gabions the perfect solution. A transverse drop structures would rest in a stream-bed. The flexibility and permeability of gabions allow water to soak into the ground, adding to the water table. The surrounding area was vegetated with local drought resistant plants and irrigated initially to quickly create the desired habitat. 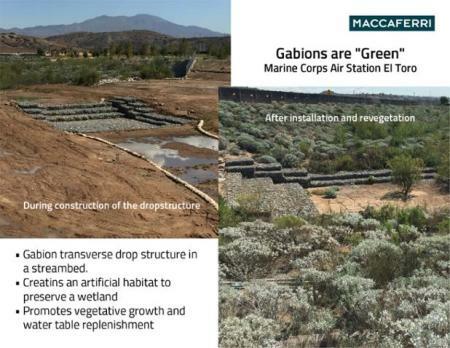 This reduces the amount of runoff into the ocean and promotes vegetation growth into the gabions. To discover all the solutions for Hydraulic Works visiting this page.